FM Warren Elliott, the 23-year old Jamaican, made history last summer by winning the heralded National Championship with a 9-0 score. Last year (2001) was a great year for the Montego Bay native as he won his fourth National title (two Nationals and two Juniors) and also earned the FM title at the 2.3.5 subzonal in Venezuela. Warren learned the game while in 1st form (10 years old) at Cornwall College, and has typified the character of a champion. Besides his 3-day training regiment with training partner NM Jomo Pitterson, he takes an active role in promoting chess around the island. While the young FM is an influence in his own right, he lists the legendary GM Mikhail Botvinnik as having the most impact on him. However, his current favorite is ever-dangerous Bulgarian GM Veselin Topolov. His favorite books are: Think like a Grandmaster and Play like a Grandmaster; The Art of Attack; The Art of Defense; all Dvoretsky's Books, and the Seven Deadly Sins. A piece of advice his gives is to solve tactical puzzles before a tournament… as if one is taking a "warm-up". 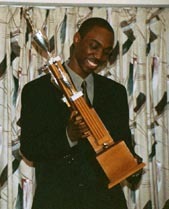 Come and meet Jamaica's 2001 "Player of the Year," and one of the brightest stars of the Caribbean, FM Warren Elliott!! TCD: Do you have any brothers and sisters? Does anybody else in your family play chess? What does your family think of your chess activities? WARREN: I have 3 brothers and 3 younger sisters. My father plays as well as my two eldest brothers but not regularly. My entire family is very supportive of my chess activities. They are extremely proud of my achievements. It makes you feel good that you can bring a smile to your family's face. TCD: How far is MoBay from Kingston and how did you end up in Kingston? WARREN: Montego Bay is a 3-hour drive from Kingston. I'm in Kingston now because I was invited to be Manager of The Liguanea Chess Club when it was in it's 3rd year of existence. The Liguanea Chess Club is a professional organization that promotes and teaches chess not just for fun or professionalism, but for it's benefits. Mr. Byfield is President and owner. So… technically I've been in Kingston for almost 4 years. TCD: Do you remember the person's name that taught you how to play? Does he still play? How did him teaching you unfold... did you make a request to learn chess, or was he assigned to a class to teach? WARREN: It was a group of people, Mr. Chin (a teacher) and Lincoln Cox (a then top school player) and Michael Watson that taught me the game. Lincoln still plays but he's heavy into medicine so.. not much. It was an initiative of the school team, senior boys and the school in general to teach 1st formers the game. TCD: After you learned, what was your first impression of chess? WARREN: I loved it immediately, because I never found it difficult. Back then we used to draw the pieces on paper and play since we didn't have enough boards. TCD: At what point did you realize that you may have some chess ability? WARREN: When I started to outplay most of my classmates, then I played a ladder tournament and played a senior player. The game lasted some 90 odd moves and he was full of praises for my resistance. TCD: What has been the reason for your rapid success? Well I had risen very quickly in Montego Bay within 1-2 years becoming MoBay Champion. I was invited to play Nationals but couldn't play for 2 years (partly because of the distance) In that break I studied with Duane Williams and occasionally with Mark Holness. This was great for my development. Then I came to Kingston to play Jamaica Open. After my first game which I won against Geoffrey Byfield, I was encouraged by everyone! (U see I wasn't expecting to win.. I just came up for the experience) I won the tournament, beating several NM's! But the most impact on my chess was probably the period I spent training with Jomo Pitterson. I used to stay at his house in Kingston. He has a vast library plus he is a top player. That's the biggest reason for my rapid success. TCD: Any notable victories in your career? Upset victories? Memorable tournaments? WARREN: Well I've beaten FM's and IM's and drew with top players but my most memorable victory was against Clerides from Cyprus (the team GM Vasilios Kotronias plays for). I recall it being very difficult to find some scintillating moves and it was pleasant to hear Kotronias say after the match, "Congratulations, you will be a GM one day!" My most memourable tournament was the 1st Nationals I won because it was against the odds. It was the highest rated Nationals ever and my first. TCD: How has the non-chess Jamaican public viewed your success? Do they give it much publicity? WARREN: The non-chess public knows of my success as chess is now starting to get some big promotions. They embrace me and even stop me on the street saying things like "Hey you are Warren Elliott; I saw you on TV!" I often go into schools and students rush you for autographs… it's a humbling feeling. I've been on TV many times, even giving blindfold exhibitions (against Simon Croskill at TVJ) I host a tournament for Juniors as you know… WEC Chess Festival and I write for the newspaper so chess is well publicized… at least so far. TCD: What is your basic style as a player? Any favorite Grandmaster game? WARREN: At first I was very positional, then very tactical, then just aggressive. Now I think my style is starting to mature and is all round. But I still lean towards sharper positions. No favourite GM games; I like the games of Tal, Kasparov and Topalov! TCD: Tell me about the Olympiads... what was your experience in these interesting countries? Were you able to meet and spend time with players from the other nations? WARREN: It's funny you mention but in Turkey I spent sometime with Robert Gwaze (Zimbabwe) and Amon Simutowe (Zambia) was in our hotel. I can't put in words how interesting the Olympiads are! You know how Jamaicans are, we are very friendly so we mingle with almost every country. Elista was my favourite Olympiad though. Oh... did I mention the girls? TCD: What are your aspirations, both chess and non-chess? WARREN: I guess... I'm taking it one step at a time. Ultimately I want to be a GM but first let's see what happens for IM? In terms of non-chess, I'm into Computer Science so one day I'll like to have a computer business for myself. TCD: Thanks for the interview and wishing you continued success!